Here’s a message from Lantau’s police chief: we will enforce the law. The new district commander, Senior Superintendent Alice Lee (above), says crime and community safety are her top priorities and that bovines and incense trees need to be protected. With just 300 police covering an area roughly twice the size of Hong Kong Island, she adopts what she calls collaborative and intelligence-based policing – in other words, finding ways to work with the community. But she acknowledges that traffic issues are critical because of the island’s narrow roads and growing vehicle numbers, and makes it clear that her officers will uphold the law. In response to the rising road risks, the number of traffic bookings has grown sharply: police issued 201 tickets in the first half of this year and 473 last year, compared to just 278 in 2014. Inevitably, the number of complaints has also soared. Lee and her team are visiting all of the local rural committees to discuss the issue and explain their traffic policies. Parking tickets are an especially sensitive issue because of the limited spaces available, particularly around Mui Wo. “I can’t tell [them] that I won’t ticket them. I’m here to enforce the law,” Lee said. She does make it clear police will issue tickets to illegally parked cars that cause danger and obstruction to other road users. They will also book vehicles illegally parked next to parking meters. Her approach to the equally contentious issue of cattle and buffalo is more straightforward. The South Lantau idyll couldn’t be more different from Lee’s previous posting. Densely-packed Kwun Tong, where she served until five months ago, has 700,000 people and nearly three times the number of officers. It experiences every kind of crime, Lee recalls. 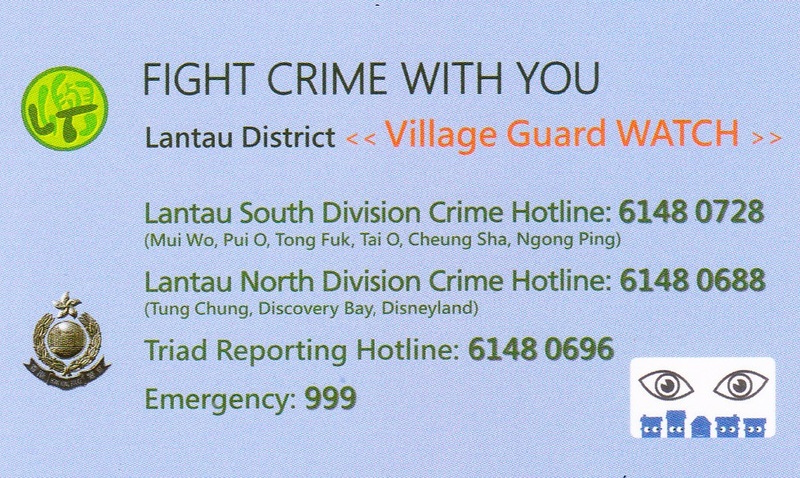 The biggest difference with Lantau is the high level of commercial crime – that barely exists on rural Lantau. Police here deal with offences like home burglaries and illegal immigrant, and personal crimes such as criminal damage and domestic disputes. They also deal with a distinctively Lantau problem – incense tree theft. Hong Kong’s name 香港 (fragrant harbour) derives from the aromatic agarwood produced by these trees. It’s in hot demand from wealthy mainland Chinese, and Lantau and the New Territories are prime targets. Lee says police have received no reports of logging this year, although a number of trees have been prepped for chopping. She says police need help from the community in identifying locations of trees and reporting logging. Lantau police responsibilities will widen further with the opening of the Hong Kong-Macau bridge, theoretically at the end of 2017. Lee’s team will be responsible for policing the landing point and the Hong Kong end of the bridge, meaning an extra 150 police will be attached to the local force. It may also mean the reopening of the old Cheung Sha police base to accommodate the extra officers, depending on the outcome of a review of office needs. Lee brings the language and ideas of 21st century management to her role. Her conversation is punctuated with references to community engagement, knowledge management, service quality and feedback. And she actually invites residents to complain. Hong Kong need many more police officer like Commander Alice, don’t we? In fact she NEVER did enforce speeding or reckless driving laws. She did whatever the Heung Yee Kuk wanted her to do. Completely useless in terms of making South Lantau safer. She said what she said strictly for PR reasons.